Applications: For use on angle grinders, size 115mm upwards, to clean stainless steel welds, remove scale and unwanted surface contaminants. Product Notes: Made from AIS1302 grade heavy duty 0.5mm stainless steel wire. 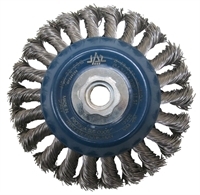 Flaring arrangement enables use on edge or as a cup brush on larger areas. M14 attachment screws directly to most angle grinders and variable speed metal finishing machines. Size 100mm diameter is recommended on 115mm angle grinder and 115mm diameter on 125mm and larger machines. Also Available: To bring stainless steel welds up to a fine pre-polished finish see our technical (unitised and convolute) finishing wheels.